Heavy Zen: Jumping Roping: A Simple way to burn fat and improve performance. Jumping Roping: A Simple way to burn fat and improve performance. Today's lunchtime run was hindered by a injury that I obtained last night while participating in an extreme jump roping demonstration. Ok, I can't lie. The truth is that I was attending the Physical Activity night at my daughters school and was showing my awesome jumping skills to the other seven year old participants. Needless to say, I landed the wrong way on my left foot and hurt myself. Not bad, but enough to limit today's run. I had my wife laughing her rear off for a good ten minutes and have obtained the nickname "Jimmy D the jumping school girl". This leads us to the obvious question, "Geeze Jim, why are you jump roping". Honestly, I have had little jump roping experience. I am pretty sure I can count the times I have participated in the exercise on my right hand. Not sure why I never did it. I guess that I always thought that big guys like me weren't meant to jump rope. It wasn't because I thought it was a girl thing, to the contrary I knew quite a few super physical/strong guys who used it effectively in their workout routine. It just didn't fit in my mindset. Well that all changed after a few cardio classes at the Dojo. I now can quickly see how jumping rope is going to help reach my health goals. Why should you jump rope? Because 10 minutes of jumping rope can provide the same calorie burn as 30 minutes of running. 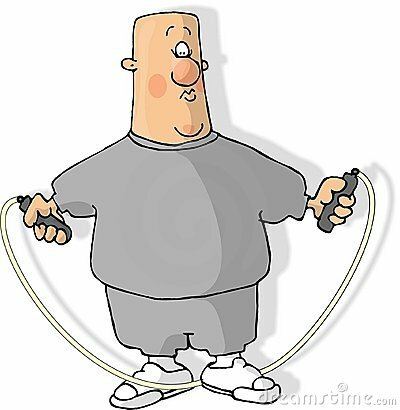 Overall jumping rope is a cheap and simple way to burn more calories, improve your footwork and your overall coordination. Add to that it's ability to makes you look super cool and you now have the perfect workout. Ok, maybe I made up the super cool part up but the message is still the same. Jumping rope is a great way to mix up your routine, burn more calories and get your old muscles moving. How do I jump rope? First you need to get a rope. I went down to Target and purchased a C9 Adjustable Weighted Jump Rope. Pretty cheap and it was big enough for a grown man to use. Next, just do it! I have started out by just trying to get some rhythm As I improve I am going to work on my abilities and change my jumping style. (ie shed the school girl look). To learn more about this check out this great video from Men's Health that shows you how to jump rope like Rocky!